How I'm feeling? Refer below. Hon, this loony girl is gonna be your wife soon. Mwahahahaha! Boy I can't help it! " It's true. Me and Hon love going to the movies to catch the latest gore (romance movies bore us). Recently, we caught Unrest and SAW 4 (before it officially opened, we can't wait!) . And damn are we so excited about the latter. 'Unrest' is considered boring to us, the typical storyline with totally bad sound effects. Even if they use real dead bodies, what's the biggie? The flow is so obvious. Now, Saw 4 is awesome!! 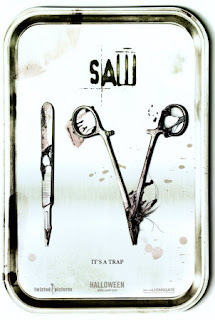 We are such HUGE fans of the Saw movie. 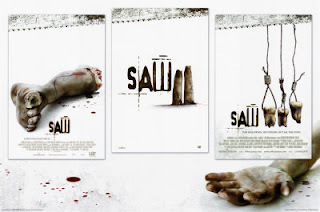 Similar to the rest of the mind-boggling Saw trilogy, we watched in excitement as we await what more gore Saw 4 can bring us. And true enough, blood spouting, insides overturned, hair torn apart, limbs scattered, eyes gored out, stomach-churning classic g-o-r-e. Beautiful. Even after the movie, we walked and talked for 1 hour about the twisted Saw 4 ending. Jigsaw is so brilliant. Even after his death, they found a tape in his stomach, and the twisted game continues in this movie. The game has not ended, in fact, it has just begun. The show also tells of how Jigsaw becomes how he is, which i find quite justified. We are so gonna watch the movie again. 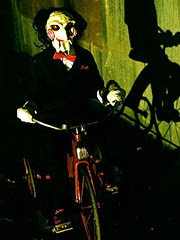 Hon even wants to buy the doll of Jigsaw riding his tricycle! And to top all that off, news on the grapevine said that Saw 5 and Saw 6 are in the works end of this year, releasing in 2009!